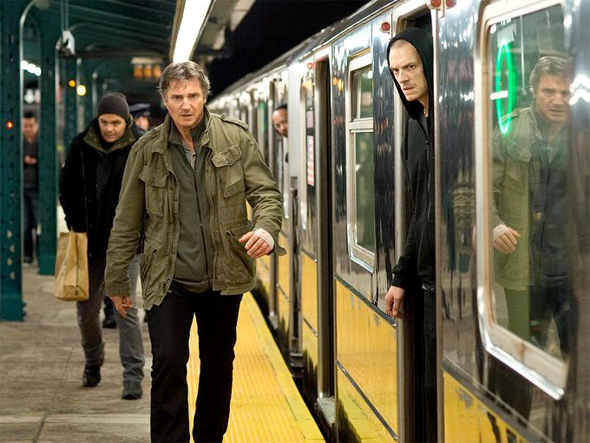 This weekend, Taken 3 hits theaters, and we hope this is truly the end for the series as the trailers and TV spots have indicated. 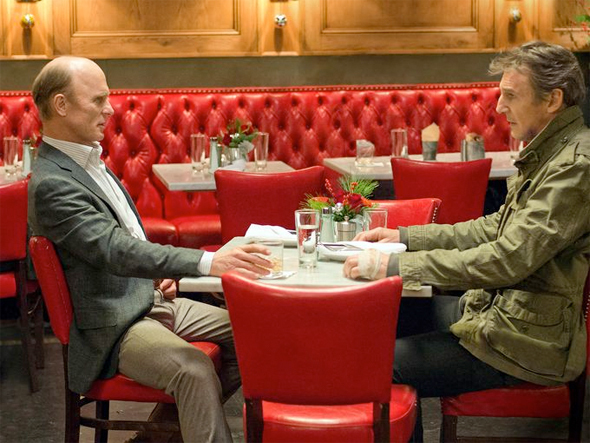 But just because this may be the final chapter for Bryan Mills doesn't mean that Liam Neeson won't see more action. 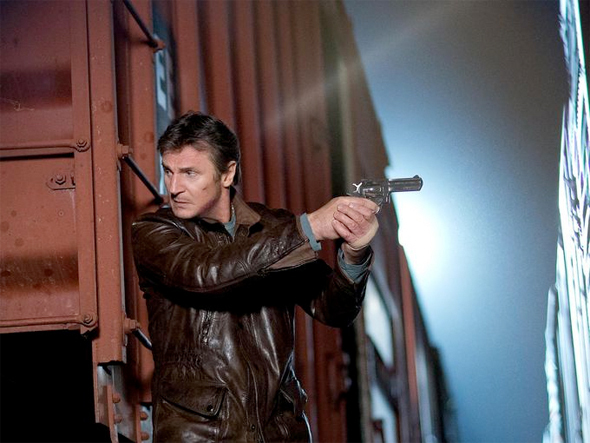 In fact, he's got another action thriller on the way this spring called Run All Night. The film teams Neeson up with Robocop reboot star Joel Kinnaman as father and son, as Jimmy (Nesson) is haunted by his criminal past, and only finds solace from his drinking. And soon, the past inevitably catches up with Jimmy, and his son ends up in danger as well. We have the first photos from the generic sounding new thriller, and they just as easily look like they could be from Taken 4 instead. Look! 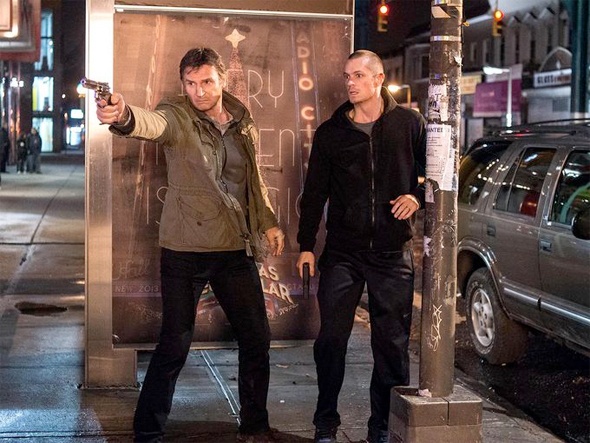 Run All Night is directed by Jaume Collet-Serra (Unknown, Non-Stop) and written by Brad Ingelsby (Out of the Furnace). Brooklyn mobster and prolific hit man Jimmy Conlon (Liam Neeson), once known as The Gravedigger, has seen better days. Longtime best friend of mob boss Shawn Maguire (Ed Harris) is haunted by the sins of his past—as well as a dogged police detective who’s been one step behind Jimmy for 30 years. And when Jimmy’s estranged son, Mike (Joel Kinnaman), becomes a target, Jimmy must make a choice between the crime family he chose and the real family he abandoned long ago. Nick Nolte, Vincent D’Onofrio and more also star in the film Warner Bros. Pictures releases on April 17th. Interested yet? Haha! Those pictures look terrible. Is Liam Neeson saving up to buy a spaceship? he is getting really close to Bruce Willis territory with the generic character recycling...he played an alcoholic cop in Walk Among Tombstones too.....guess Neeson gotta eat! I'll decide when the final chapter of Bryan Mills' life is written. Why even bother with a movie title anymore... all his recent movies and his characters look the same. From the guy who brought us NONSTOP and UNKNOWN? Oh boy...this should be perfect fodder for long flights.